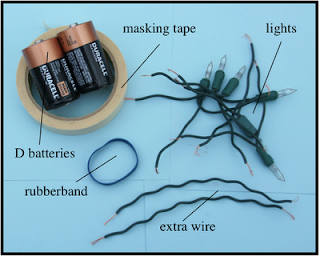 Grandad Science: Light the Lights! Grandmother and I spent the recent holidays with our oldest son and his family in Yorktown, Virginia. We hadn’t seen grandsons John and Andrew since the previous winter when they were living near Dayton, Ohio. Being an Air Force family, they are used to frequent moves. There is so much colonial history in Virginia and we enjoyed visiting the Jamestown settlement and several other battlefields and historical sites. When the boy’s mother and grandmother started putting lights on the Christmas tree they found a string of lights that didn’t work so she discarded the string. The boys and I were sitting in the kitchen enjoying a snack so I asked if they would like to ‘light the light’. They weren’t sure what I was talking about so I went to the garage and got a pair of wire cutters from dad’s toolbox. I cut off several of the lights from the discarded strand, found a couple of batteries, some masking tape, and a rubber band and soon the boys were testing each of the lights cut from the strand to identify those that would still light up. 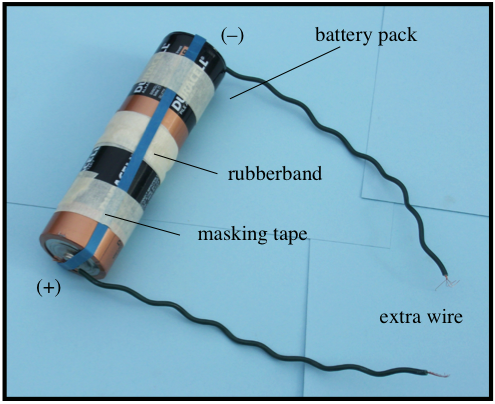 To make a safe source of electricity, I taped the two batteries together (bump (+) end to flat (–) end), stretched a rubber band lengthwise around the batteries, and secured the rubber band with additional wraps of masking tape. You should have a bump (+) on end and a flat side (–) on the other end of the taped-together batteries. 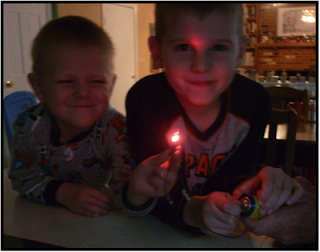 The boys discovered it was much easier to test a light if they worked together, one held the wires to the batteries and the other held the wires to the light. 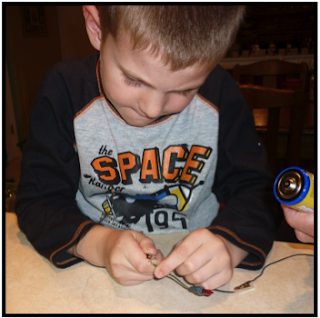 Once we had a set of working light bulbs I had the boys wire two of the bulbs end-to-end. 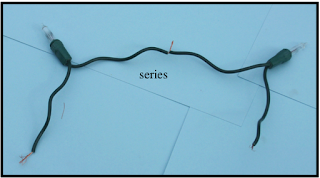 The bulbs are wired in series. Next, I had the boys wire three bulbs together, three ends connected on one side and three ends on the other side. 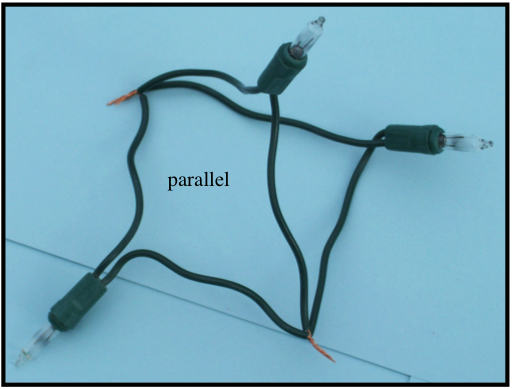 These bulbs are wired in parallel. 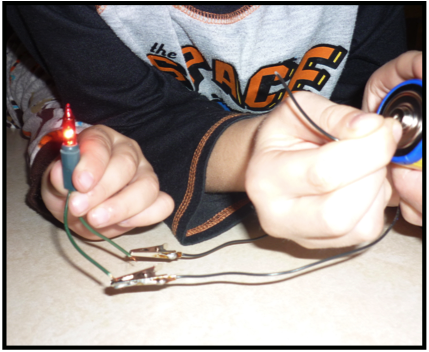 The boys found that the three bulbs wired in parallel would all light with the same brightness but the two bulbs wired in series did not glow as bright. Also, one of the two bulbs wired in series glowed a bit brighter than the other bulb. The boys know nothing about ‘voltage drops’ or any of the other basic concepts of electrical theory but their answers as to why the three bulbs glowed with the same brightness struck me as intuitively correct. The said the three bulbs shared the electricity equally. But for the two bulbs wired in series, the first bulb ate more of the electricity than the second bulb. See what you can learn by talking to kids! And, as all kids know, experiments with light bulbs always work better in the dark.